Outski: We made top 64! Now, you can help us win a People's Choice Award! We made top 64! Now, you can help us win a People's Choice Award! 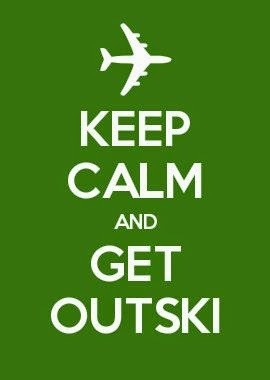 Recently, Outski applied for entry into a competition called Venture Madness, that pits 64 promising startups against each other. We are excited to announce that Outski has been chosen as one of the 64 most promising startup companies in the Southwest, and are now officially in the competition! Like March Madness, Venture Madness also has a bracket challenge that anyone can fill out and submit for a chance to win prizes! The first place winner (entrant with the highest points) will receive a MacBook Air ($999 value), and second place (entrant with second-highest points) will receive a 64 GB iPad Air 2 WiFi ($599 value)- both to be awarded by Invest Southwest. Click here to view complete contest rules. Right now, we are asking all of our users and social media friends to get involved. You have until 5 PM (MST) on January 18, 2015, to complete and submit your bracket. 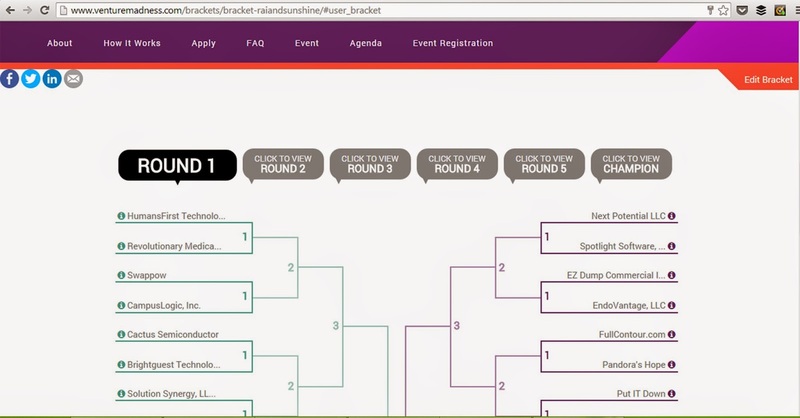 The startup with the most amount of brackets labeling it (ahem, Outski) as the champions wins the People's Choice Award, and $5,000 cash. This competition is independent of the official judging, so YOU have all the power to choose the winner of this award! Our social media guru, Rachel, recently went through and created an account and took screenshots of the process, so that you can see what it looks like. 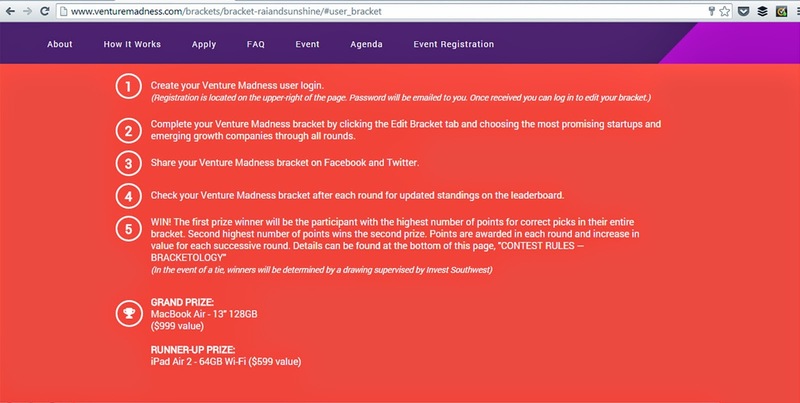 To register: Head over to Venture Madness. 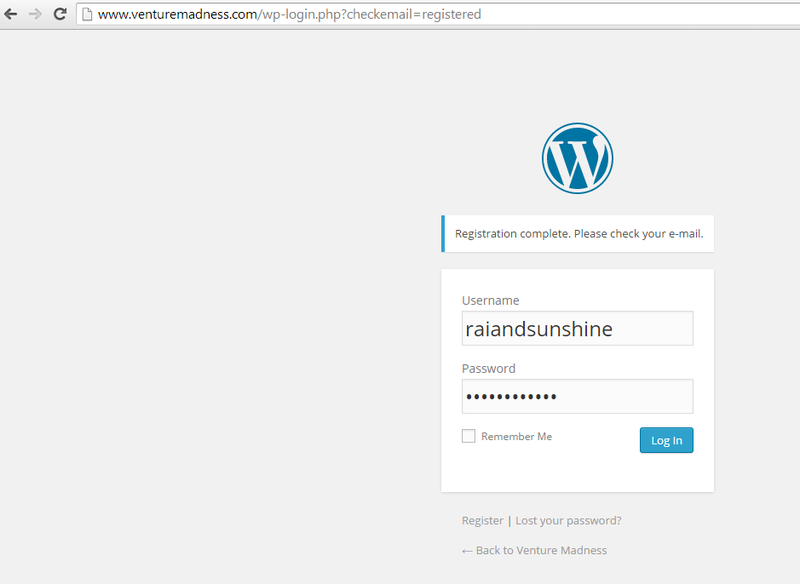 You only need to provide your email address and create a username. It takes 10 seconds! A password and a link will be sent to your email. Just log in, and start editing your bracket! Pick an awesome name for your bracket. You can read about all the companies by clicking their names. Then, click on the red bar to edit your bracket.